I love every aspect of traveling, from planning to booking to flying to actually being at my chosen destination. Of course, that doesn’t mean any of that is easy. One of the most challenging aspects of planning a trip, I’ve found, especially the last few years, is figuring out how to cover my shoulders and knees in 90+ degree weather. I guess it’s my own fault for being drawn to destinations that are conservative, religious, and/or developing, but those are the places I want to visit the most: Cambodia, India, Thailand. Our latest destination, Morocco, is no different. Every site and book I read about the Muslim country in northern Africa emphasizes that exposed shoulders and knees are verboten. Of course, I see plenty of photos (especially from style bloggers) of skimpy dresses and tanks all over the Web. And while Morocco is such a big tourist destination, especially for Europeans, that I’m sure the locals have seen their share of scantily clad visitors, I’m always cognizant of respecting the local culture and dressing in a way that will not offend. Besides, dressing respectfully is one way to minimize the likelihood of harassment or targeting, something that can really put a damper on one’s travels. So the challenge for me is always putting together outfits that are respectful yet breathable, comfortable, stylish (and I don’t feel comfortable unless I feel stylish), and not too precious (because you have to expect sweat, dirt, and stains by the end of the trip). After months of planning and lists and shopping (and returns! ), I think I’ve finally figured out how to achieve all of the above for our upcoming trip to Morocco. In hot weather, if I need to cover my knees, I rely on maxi skirts. This is especially important because I also usually have to wear low-heel shoes (I generally can’t do flats — I’m a total heels girl), and low-heel shoes paired with midi skirts is a very unflattering look on me. The problem is I’m not a flowy, girly maxi skirt kind of dresser. I lean more masculine, minimalist, sporty, or sophisticated, but rarely feminine or flowery or boho. Even when I wear something more girly, I always try to pair it with something to balance it out, whether it be a wide-brim fedora or platform sport sandals or wide-legged pants. So it takes me a lot longer to put together outfits that tend to be more bohemian but I still feel comfortable with. 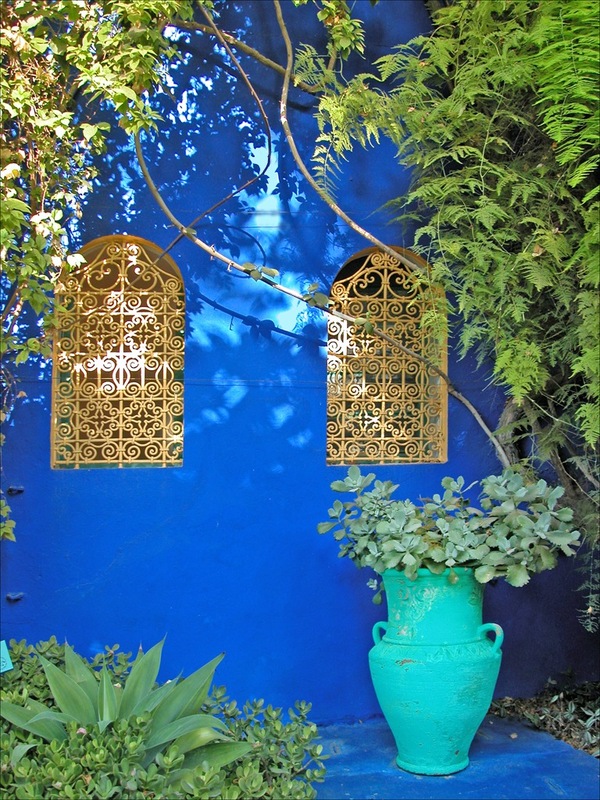 Aren’t these blues at the Majorelle Gardens in Marrakech to die for? 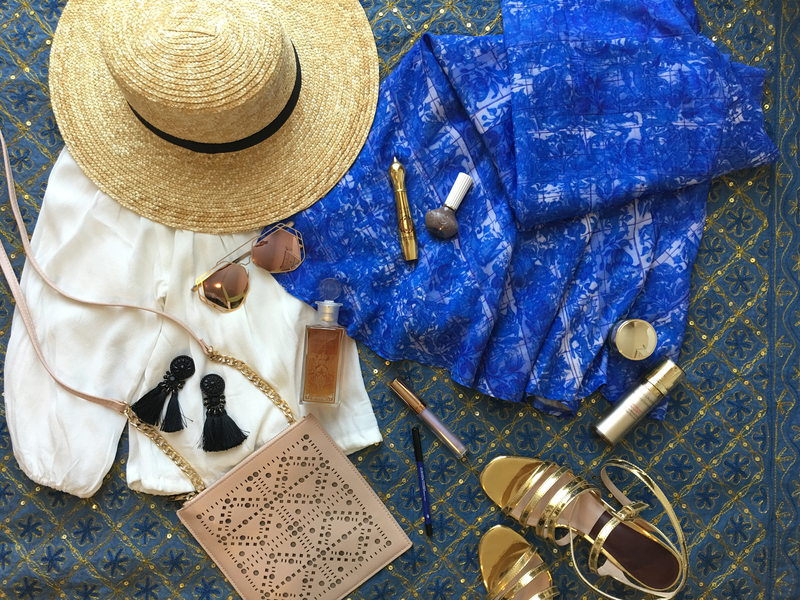 I was also inspired by the Majorelle blue of Yves Saint Laurent’s garden in Marrakech, a big must-do in the city, as well as the weepingly gorgeous blues of Chefchaouen, a small city in northern Morocco that we are going way out of our way to visit. You may have seen Chef (or Chaouen), as the locals call it, on social media — it’s the blue city with buildings drenched in the most amazing shade of cyan-periwinkle. H&M blue print skirt. I love it because the hem is slightly asymmetrical, higher on one end than the other, a feature I’m really into in tops and bottoms right now. Yes, it’s feminine, but the silhouette is pretty sleek. I got it on sale for about $20. Who What Wear x Target off-shoulder white top. The great thing about this top is that the elastic around the neckline is such that you can wear it not off-the-shoulder. So in the Medina I can wear it like a regular, shoulder-covering top, and still have the option of pulling it off-shoulder in our riad or at a nice restaurant (where I hear they’re more forgiving). Zara metallic gold sandals. I’ve worn these all summer, as you may have seen on my Instagram feed. The most comfortable sandals ever (the block heel is a godsend), and the flash of metallic dresses everything up. Topshop wide-brim boater hat. A sun-shielding hat is vital, utterly vital, for me in any sun-drenched destination. This one has an extra wide brim to protect me from aging UV rays. H&M tassel fringe earrings. I’ve been wearing these all summer as well, and I have to say, they really add a little something to pretty much anything I wear. They have a nice Spanish flamenco vibe, like the boater hat, and they dress everything up without feeling too dressy. ASOS laser-cut crossbody. A major consideration when traveling is the bag I’ll be carrying around all day. I wore a large crossbody in Turkey, and the uneven distribution in weight really took a toll on my back and hips. So this time I’m bringing a cute blush colored backpack that converts into a shoulder bag. Of course, a backpack isn’t exactly pickpocket-proof, so I’m also bringing a small, flat crossbody like the ASOS one for my money. It’s so much chicer (and comfortable) than a money belt, and it just so happens to match my backpack. 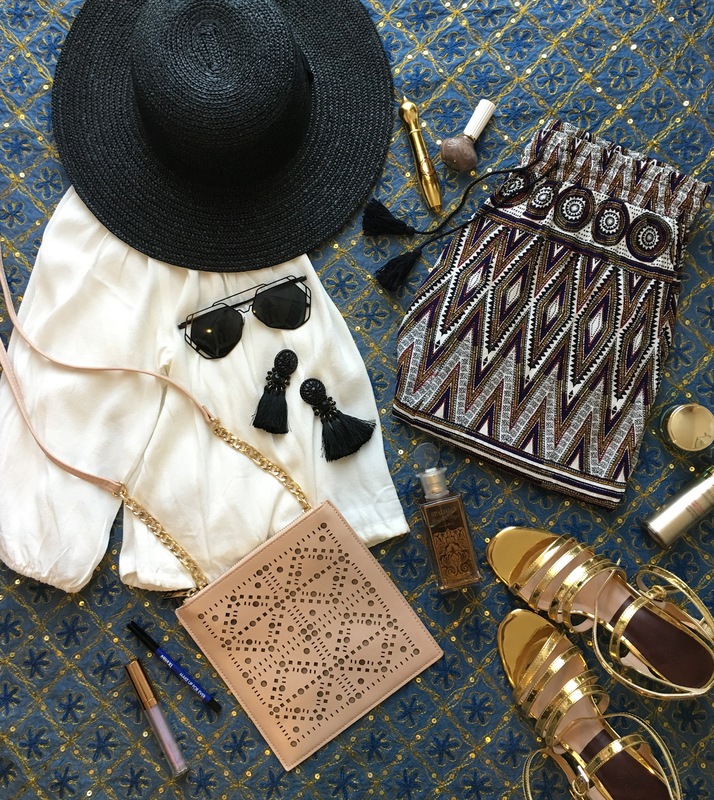 The second outfit I put together is inspired by the zellige tilework and kufic carvings of the famed medersas in Fes and Marrakech. 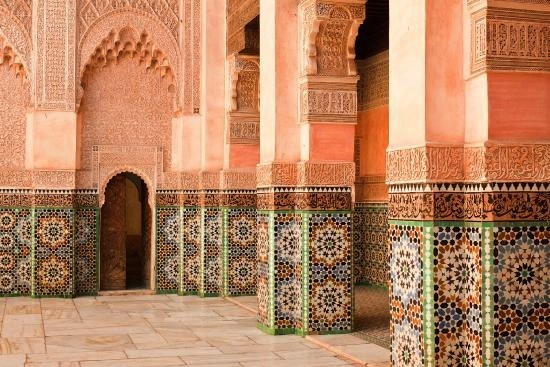 I’m in love with the photos I’ve seen of the gorgeous Moorish architecture all over Morocco and southern Spain, and while I don’t know that I’d necessarily wear these in my everyday life in L.A., I think they’ll blend in beautifully in the medina and at some of these historic sites. Ben Youssef Medersa in Marrakech. 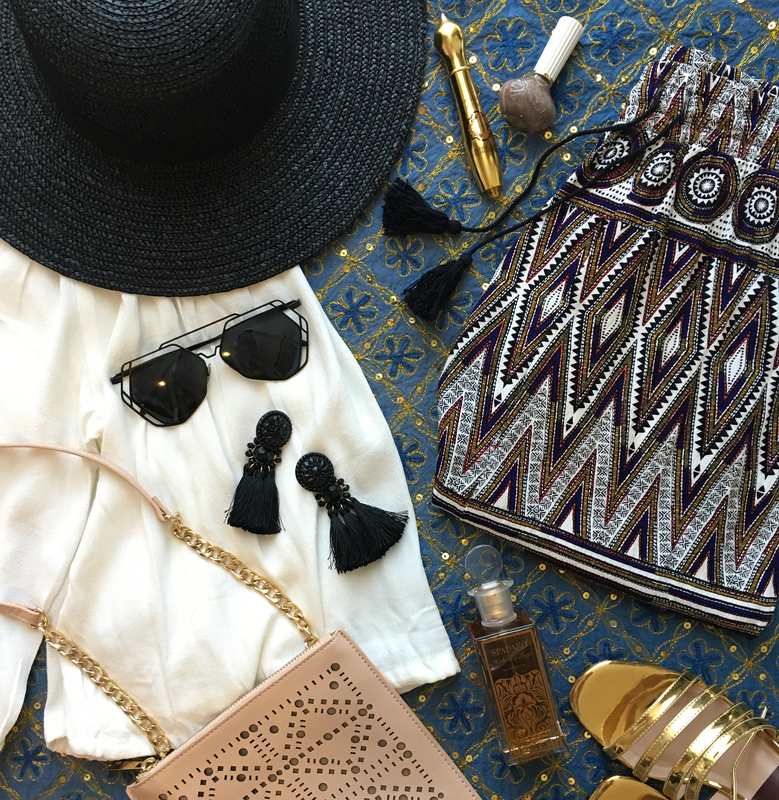 You’ll notice that many of the pieces in the outfit above are the same as in the Majorelle outfit. I believe in wearing everything at least twice while traveling. It’s just good travel sense — you save space in your suitcase (we generally prefer to travel as light as we can), and I like the challenge of distilling my outfits into mix-and-match looks that still stand well on its own. H&M geometric print maxi skirt. I love the tassels on this skirt, and since it’s got pockets — a huge bonus in my book. Black non-mirrored sunglasses. While I love, love, love the rose gold version of the black sunglasses above, I read that the mirrored lens can reflect the sun’s rays onto your cheeks. (I still haven’t figured out how that works, but hey, I’m not taking the risk. I toil away every day on my skin care to fight sun damage, so I’m not going to undo all that effort in one fell swoop just for the sake of looking cute.) I got these for under $15 at Yesstyle.com, a Korean fashion site. Most importantly, each item of clothing on my packing list is under $100 because, again, I don’t believe in taking anything with me on my travels that I can’t afford to lose. I even switch out my wedding ring for a fake gold or silver band (because it’s still important to wear one to avoid harassment from local men). After all, the last thing I want to do while gazing at some millennia-old historic palace is worry about soiling my skirt, scratching my bag, or losing a ring. Because now that’d be a travel foul. Hi, Ann, I wish you a Nice Trip, first of all! Thank you so much! I see you’re a true traveler! I would love to visit the Middle East some day — there is so much history and beauty there. I do see dressing for these more conservative countries as a way to express a different side of my style, so that’s a great way to look at it. I hope you get to travel again soon. To me, it is like air or water — an absolute necessity!